I saw this on tumblr and realized that it fits what happened to us at the end of our relationship. To most of you, I did my best to make things work but you failed to notice it. I talk things out; that's just how I am but you shut me out. I tried and tried but you refused to notice that there was something wrong or if you did notice, you just didn't care enough to work on things. So I stopped talking. I stopped caring. I stopped loving. I had to you see. I had to. I needed to save myself. I needed to love me, even just a little bit. I loved you too much. I wanted it to be forever; I thought it was gonna be forever. It hurt too much. You broke me into a tiny million pieces and I was left on my own to pick up the broken little pieces that is me and my heart. I hurt too much because I loved too much. It hurt that I loved too much because you loved me too little. Finally, you noticed. Unfortunately, it was too late. 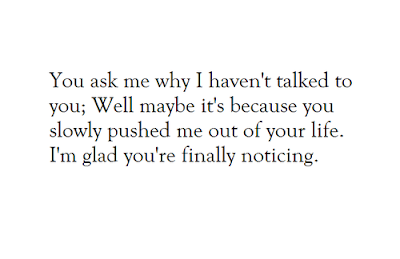 You pushed me away. Once pushed, I can no longer turn back. You see, the only time you succeed in pushing me away is when I finally learn to let go ... and you taught me that I can let go. 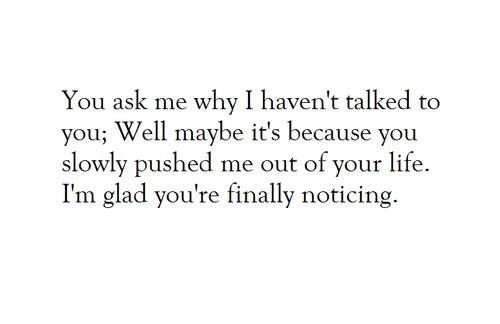 I'm glad you noticed though.